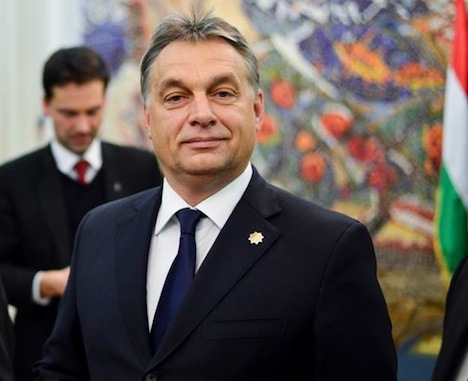 The global financial crisis in 2008 showed that “liberal democratic states can’t remain globally competitive,” Orban said on July 26 at a retreat of ethnic Hungarian leaders in Baile Tusnad,Romania. It’s hard to know just how seriously to take Orbán’s latest comments. If his first government, over a decade ago, was traditionally liberal conservative, Orbán’s most recent term was marked by more nationalist, illiberal and authoritarian tendencies. It’s not hard to believe that, with a two-thirds majority behind him, Orbán could turn fully away from liberal democracy and toward illiberal authoritarianism in his third term. Other Hungarian commentators argue that Orbán’s emphasis was on the liberal market system and its failures during the 2008-09 global financial crisis. In that sense, Orbán may have been calling merely for a shift from a European social welfare state to a more state capitalist model. 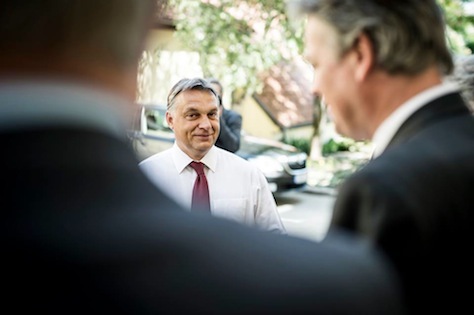 Though Orbán came to power as a liberal market proponent, his 2010-14 government engaged in healthy spending on public works programs, nationalized Hungary’s private pensions system and introduced the highest VAT rate in the European Union (27%) in a bid to end Hungary’s €20 billion post-crisis loan program with the International Monetary Fund. 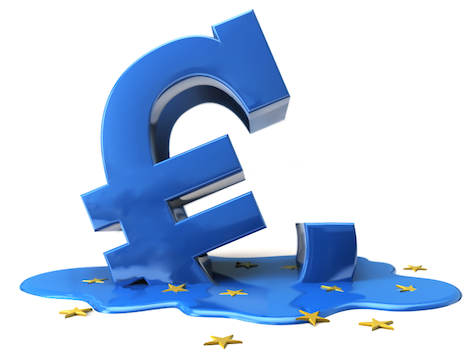 Nonetheless, even significant moves in that direction could spook global markets, send the Hungarian forint plummeting or dampen growth and investment. 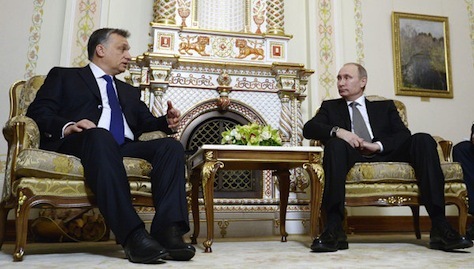 Orbán’s weekend speech came as he, like Russian president Vladimir Putin (pictured above, right, with Orbán), has called for restrictions on international NGOs throughout the country. Though Hungarians revolted in 1956 against Soviet rule and in favor of freedom and democracy in one of the most dramatic Iron Curtain revolutions of the Cold War, Hungarian relations with Russia today are arguably better than Hungary’s relations with leading EU member-states. Orbán, who burst onto Hungary’s political scene a quarter-century ago as an anti-communist activist, signed a $14 billion lending deal with Russia in January in pursuit of greater nuclear energy. Last Sunday Hungary had a paradoxical election. Politicians and commentators had forecast that this vote would set the future direction of the country. It would determine whether prime minister Viktor Orbán and his nationalistic party Fidesz – Magyar Polgári Szövetség (Fidesz – Hungarian Civic Alliance), would be able to strengthen their hold on power, or the leftist opposition would run Hungary according to more mainstream ideals of capitalism and liberal democracy. In fact the election turned out to be something of a flop, with only 61.2% of the electorate casting their vote. Only one parliamentary election in the country saw a lower rate of participation since democracy was restored in 1989. The results too were paradoxical. Opinion polls had forecast a major victory for Fidesz. 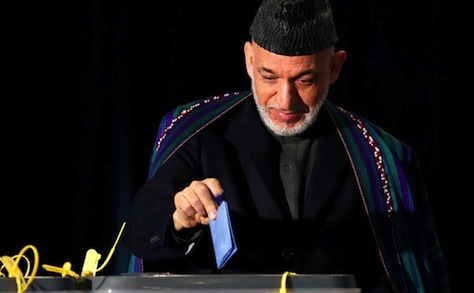 Some commentators had chosen to disbelieve them, as they thought that a significant number of voters would not feel free to say that they would be voting against a party that is known to have punished its opponents. In fact the polls turned out to be correct, and Fidesz won by a broad margin. It is not yet clear exactly how many seats they will win, as some votes (including those of Hungarians living abroad) still have to be counted four days after the election. However, it is likely that they will take 133 of the 199 seats in parliament, or just over two-thirds of the total. That means that they will hold on not only to power, but also to their supermajority of two-thirds of the seats. This supermajority has enabled them to change every law of the country since 2010, and to enact a new constitution that came into power in 2012. The left-wing opposition have not only failed to bring down Orbán’s government, which had been their aim at the election, but they have barely dented his majority in parliament. Orbán celebrated what he called “a victory that shook the sky”. In fact the results are less favourable for him than they might appear, and they hold risks for all parties concerned. In the previous parliamentary elections of 2010, Fidesz won 52.7% of the national vote. This time the party only won 44.3%, according to the most recent figures, despite the strong support of ethnic Hungarians living abroad, who were enfranchised by Fidesz in 2011. The left-wing opposition coalition, consisting of the Magyar Szocialista Párt (MSzP, Hungarian Socialist Party) and four recently founded small parties, won 26.2%, which is significantly better than the 19.3% won by the Socialists in 2010. The other large force opposing Fidesz, the far-right-wing Jobbik Magyarországért Mozgalom (Jobbik), also increased its share of the national vote from 16.7% to 20.7%, while the green liberal party Lehet Más a Politika (LMP, ‘Politics Can Be Different’) saw its share fall from 7.5% to 5.3%, which is just above the threshold of 5% that is required to send deputies into parliament from the national list. 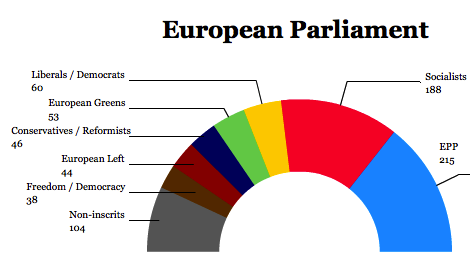 Still, this is not a bad result, given that LMP split in 2013 and a number of its deputies founded one of the parties that has allied itself with the socialists. 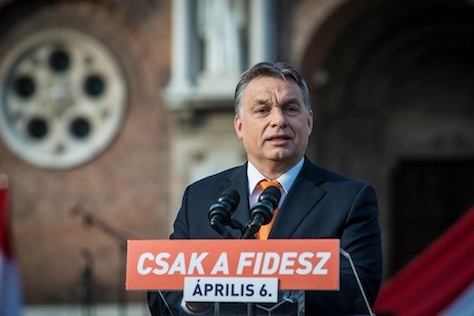 With almost all ballots counted, Viktor Orbán has not only won reelection as Hungary’s prime minister, he will also command the same two-thirds supermajority as his party, Fidesz – Magyar Polgári Szövetség (Fidesz – Hungarian Civic Alliance), has held for the past four years. But the other winner in Sunday’s election is the nationalist, far-right Jobbik Magyarországért Mozgalom (Jobbik), which improved on its 2010 performance to win nearly 21% of the vote. With just over two-fifths of the vote, Fidesz will win over two-thirds of the seats in Hungary’s Országgyűlés (National Assembly), which Orbán reduced in number from 386 to 199 for this year’s election. That will continue its power to determine Hungarian policy, virtually without opposition — in the past four years, Orbán has used a similar supermajority to rewrite the Hungarian constitution, diminish the power of the constitutional court, and revise an election law that maximized his party’s gains in Sunday’s election. Though Lehet Más a Politika (LMP, Politics Can Be Different), a liberal green/left party, seems likely to to make it into the National Assembly (just barely! ), the election results leave Orbán with almost nearly the same supermajority that he had in 2010 and, in fact, Orbán is the first prime minister to win reelection in Hungary since 1990. 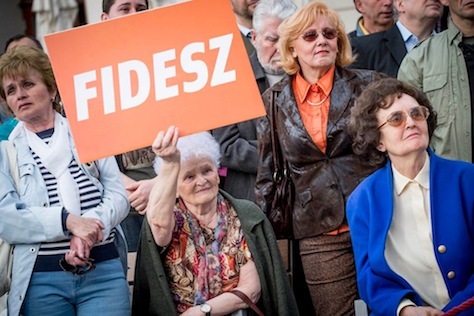 The center-left opposition, Osszefogas (‘Unity’), hardly won a quarter of the vote, and it barely overtook the surging, xenophobic, euroskeptic Jobbik. That’s despite a late-January attempt of the center-left and centrist opposition to unite behind Attila Mesterházy, the leader of the Magyar Szocialista Párt (MSzP, Hungarian Socialist Party). It’s the worst of both worlds for European policymakers who hoped that the 2014 Hungarian elections might curb Orbán’s power — not only has Jobbik made real gains (thereby making itself almost as strong as the center-left opposition just two months before European parliamentary elections), but Orbán and Fidesz will hold an impregnable supermajority for the next four years to continue consolidating power, eliminating checks and balances and, potentially, reducing faith in the rule of law and Hungary’s democratic institutions. Despite a united opposition front, prime minister Viktor Orbán is headed to a crushing victory in Hungary’s April 6 parliamentary elections this weekend, consolidating his hold on power in the emerging central European country of 10 million. Orbán’s victory looks so assured that it’s hard to believe anyone ever thought that his chances for 2014 reelection would be much tougher. 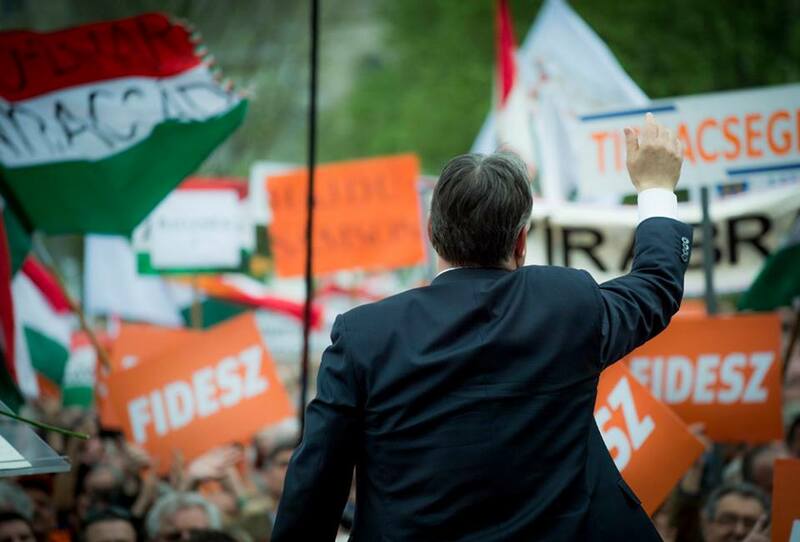 Only a year ago, Orbán appeared to have a much more troubled path to victory. For example, an Ipsos poll from January 2013 shows that the three largest of the five parties that comprise the opposition, Osszefogas (‘Unity’), would win a combined 43% of the vote, compared to just 41% for Fidesz – Magyar Polgári Szövetség (Fidesz – Hungarian Civic Alliance). The largest opposition party, the Magyar Szocialista Párt (MSzP, Hungarian Socialist Party) won 32% of the vote. RELATED: Hungarian left unites, but will it be enough to stop Orbán? 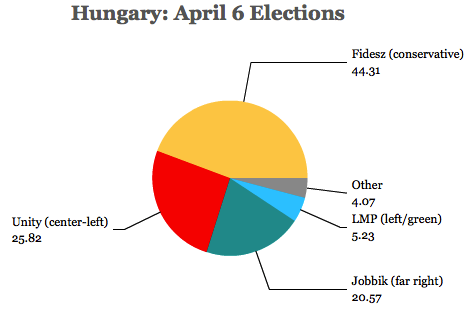 But the most recent March 31 Századvég poll gives Fidesz 51% of the vote, with just 25% for Unity. The far-right, anti-Semitic, ultra-nationalist Jobbik Magyarországért Mozgalom (Jobbik), which has surged over the past six months, would win 18%, and there’s a chance that it could actually win more seats on Sunday than the center-left Unity. In early 2013, despite an uphill challenge under new election rules, designed to benefit Fidesz, the opposition had a strong case against Orbán, who has isolated Hungary from the rest of the European Union, increasingly chipped away at democratic checks and balances and the rule of law, and nearly torpedoed an already struggling economy with tax increases, further budget cuts, and a haphazard nationalization of Hungry’s private pension system. Hungarian left unites, but will it be enough to stop Orbán? As Hungarian prime minister Viktor Orbán hopes to consolidate his hold on Hungarian government in the country’s April 6 elections, the Hungarian center/left is uniting in a broad anti-Orbán coalition. 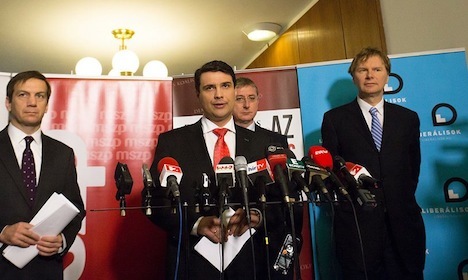 Under the banner of Osszefogas (‘Unity’), five of Hungary’s center-left parties will band together behind the prime ministerial candidacy of Attila Mesterházy (pictured above, center), the leader of Hungary’s largest opposition party, the Magyar Szocialista Párt (MSzP, Hungarian Socialist Party). Együtt 2014 (E14, Together 2014) is a new social democratic party founded in October 2012 by former prime minister Gordon Bajnai, a Socialist who governed Hungary s somewhat of a technocratic caretaker between April 2009 and May 2010, when which Orbán came to power with a supermajority. Bajnai’s government tried to steer a course through crippling budget austerity and an economy that hit its nadir with a 6.8% contraction in 2009. From the outset, Bajnai (pictured above, far left) has advocated a united anti-Orbán front for the 2014 elections. Párbeszéd Magyarországért (PM, Dialogue for Hungary) is a green liberal party founded in February 2013 as a breakway faction of Lehet Más a Politika (LMP, Politics Can Be Different), another green party founded in 2009. PM’s leaders are Timea Szabó and Benedek Jávor, the latter an environmental lawyer and botanist. The party has, since March 2013, been allied with E14 in advance of this year’s elections. Demokratikus Koalíció (DK, Democratic Coalition) is the party of Ferenc Gyurcsány, prime minister between 2004 and 2009, and it was founded in October 2011 when Gyurcsány (pictured above, center, behind Mesterházy) left the Socialists, taking with him 10 of the Socialists’ 59 seats in the National Assembly. Gyurcsány’s decision to unite under Mesterházy is particularly helpful for the anti-Orbán opposition because Gyurcsány remains more well-known than Mesterházy. Even though Mesterházy led the (disastrous) 2010 electoral effort, Gyurcsány has more governing experience and political canny. Gyurcsány, who came to power at a time when Hungary’s budget deficit was spiraling out of control (even in pre-crisis days), resigned in 2009 after introducing ever harsher budget reforms in line with a 2008 financing agreement with the International Monetary Fund. Gyurcsány’s budget reforms, and his attempt to modernize the Hungarian health-care system, alienated him from his own party. The Magyar Liberális Párt (Hungarian Liberal Party) was founded in April 2013 as a pro-European, liberal party by Gábor Fodor, a former education minister in the mid-1990s and an environmental minister in 2007-08. Fodor (pictured above, far right) was the the final leader of the Alliance of Free Democrats/Liberal Party, a predecessor to the current party that divided in 2008, when the liberal coalition lost the last of its 20 seats in the National Assembly. Though the green LMP hasn’t joined the coalition, the five-party front is demonstrating about as much unity as you could expect — and much more than the alternative, much feared a month ago, that Orbán would take advantage of the disunity to win an outsized supermajority in the National Assembly. In the current 386-member National Assembly, Orbán’s ruling conservative party, Fidesz – Magyar Polgári Szövetség (Fidesz – Hungarian Civic Alliance) controls 226 seats. Together with its ally, Kereszténydemokrata Néppárt (KdNp, Christian Democratic People’s Party), which today has become more a satellite of Fidesz than a truly independent party, Orbán controls 263 seats. That’s a supermajority of just over two-thirds, and that’s permitted Orbán to introduce constitutional reforms and other laws that have strengthened his hold on power and undermined Hungary’s democratic institutions. The Socialists control just 48 seats, and the far-right nationalist Jobbik Magyarországért Mozgalom (Jobbik) controls 43 seats. Under new electoral rules, the National Assembly will be reduced from 386 seats to just 199 seats. Unlike the prior system, where just over half of the seats were determined by proportional representation, the new system tilts slightly more toward plurality districts — 106 seats will be determined in single-member districts by first-past-the-post voting. Another 93 seats will be determined by party-list proportional representation (with a 5% threshold for parties and a 10% threshold for coalitions). In an election with five center-left parties competing against each other as much as against Orbán, Fidesz remained the overwhelming favorite to with the 106 plurality seats. So the unification of the center-left opposition makes a nearly impossible race merely a tough race. A January 15 IPSOS poll shows Fidesz with around 48% of the vote, the Hungarian Socialists with 27%, Jobbik with 11% (far below the troublingly high 17% it won in the April 2010 elections) and other parties in single digits. But when you add the new Unity coalition totals together, Fidesz leads by a more narrow margin of 48% to 37% (DK and E14 each win 5% of the vote. If the election were held tomorrow, Fidesz would still win, but the Unity coalition might together win seats that would otherwise fall to Fidesz. In other words, Mesterházy and the united opposition would turn a landslide defeat into a robust defeat.